The Suzuki triangle models the relationship between parent, teacher, and child as they learn and share together in their first musical instrument experience. The Pre-Twinkle experience is a time for planting the initial musical seeds for our youngest students. If we give them proper nurturing within the Suzuki triangle, they will begin to blossom, a little at a time. Pre-Twinkle classes are partner lessons and begin with parent orientation. Parents are strongly encouraged to come on their own for these sessions that last approximately four to six weeks. During these sessions, teachers focus on the Suzuki philosophy and history, techniques to practice with children, and introduce the instrument itself. Parents will continue to learn and understand these concepts as their child begins lessons. After Pre-Twinkle classes begin, families observe at least two private lessons (arranged by the teacher) to watch the various aspects of the Suzuki method at work. There are also opportunities to observe group classes, recitals, and concerts. The Pre-Twinkle class experience gives new students and parents an idea of what to expect and a sense of the lifelong impact of the Suzuki method. 1. 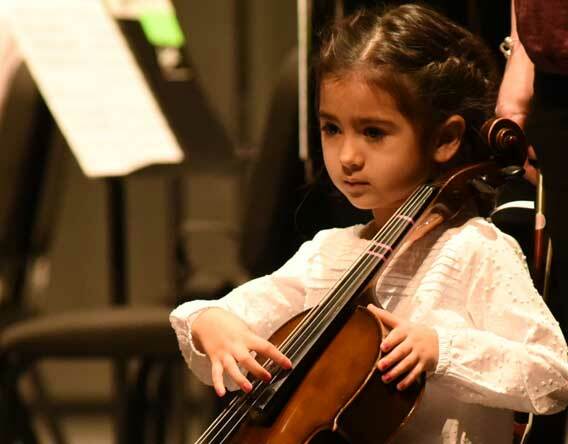 Please note that students ages 3 (violin, viola, cello, flute) and 4 (piano) begin in Pre-Twinkle partner classes; students ages 5 and above begin in private lessons. Partner lessons do not begin until a satisfactory match of student ages and faculty times has been found. Please be patient, this often takes time. 2. Pre-Twinkle classes meet two times per week and are comprised of two to three students of similar ages. 3. Pre-Twinkle classes are usually offered in the morning or early afternoon (9AM-3PM), depending upon faculty and family availability. 4. Pre-Twinkle classes are offered in fall and spring semesters, not during the summer. 5. Since parental involvement is an integral part of the Suzuki method, parent attendance is required at all classes. 6. If a student’s age is close to 5 years (4 ½ and beyond) and a partner cannot be found, you will be contacted to start private lessons at the next available opening. 7. For Preucil preschool students interested in enrolling in music lessons, please consider the following time/day options when you complete your placement form: immediately after preschool finishes or on a non-preschool day. Parents learn so much by observing other children learn. Parents and children gain from watching and listening and from being observed by others. “Enjoyment of the moment” is a key Suzuki phrase. We hope parents will enjoy their child’s development and trust in what is to come. The Suzuki Philosophy is based on love, and discipline is part of love. As children begin lessons, we train them to understand behavior expectations. We count on parents’ help and cooperation to aid in the child’s progress and to help maintain a learning atmosphere. Children and parents are expected to be on time and stay until the class has concluded. We do not make up these classes. If the child has to miss, we ask the parent to come, take the lesson, observe the other children, and participate in the discussions. Parents are encouraged to call the teacher if they have questions or simply need some reassurance. Two thirty-minute classes per week with two children or two forty-five-minute classes with three to four children, each with a parent. This approach offers hands-on experience for the teacher and student and time for training the parent as home teacher. Classes include discussion of Suzuki philosophy and its application, questions and answers, parent lessons, individual instruction with each student, observation of each other’s lesson and group activities. Students may stay in partner lessons for the second year, move to private lessons or utilize a combination of the two, based on teacher recommendation. Teacher and parent decide whether to proceed to a second year of partner classes at the end of the child’s first year of study. Level II provides an additional year of instruction on the skills and topics introduced in Level I. Once the student has reached a minimum playing level, he/she is eligible to join the Foundation Class (at an additional fee) on Thursday afternoons. During the Foundation Class, children work together with the teacher to review fundamental violin skills and pieces already learned. This group experience continues throughout Suzuki study. Children move to individual thirty-minute lessons and continue to participate in the string curriculum following Level II. Two thirty-minute classes per week with two children or two forty-five-minute classes with three children, each with a parent. Two group classes per week are highly recommended for beginners under age five. However, if scheduling in a group setting is impossible, the three or four year-old beginner and parent can enroll in a thirty-minute private piano lesson. After the first Pre-Twinkle year, the teacher determines whether the student’s age and attention span indicate readiness for another year of group class or move to a thirty-minute individual lesson. Two thirty-minute classes per week with two to four children, each with a parent. The cello program uses the same approach described for the violin Pre-Twinkle program. Twice-weekly Pre-Twinkle cello classes continue until the teacher and parent decide the child is ready for individual lessons. At that time, the student joins the Thursday afternoon Book One cello class.